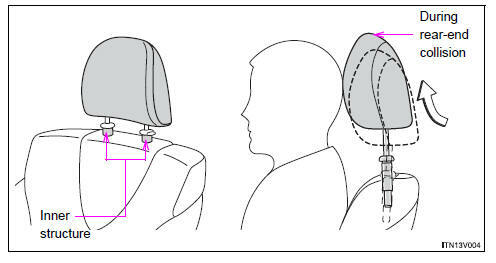 When the occupant’s lower back presses against the seatback during a rear-end collision, the head restraint moves slightly forward and upward to help reduce the risk of whiplash on the seat occupant. Even small forces applied to the seatback may cause the head restraint to move. 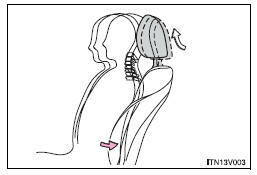 Pushing up a locked head restraint forcibly may make the inner structure of the head restraint appear. This does not indicate a problem. • Be careful that the seat does not hit passengers or luggage. • Do not recline the seat more than necessary when the vehicle is in motion to reduce the risk of sliding under the lap belt. 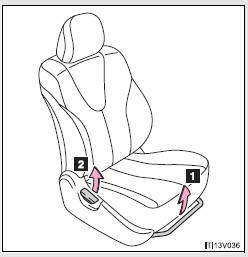 If the seat is too reclined, during an accident the lap belt may slide past the hips and apply restraint forces directly to the abdomen or your neck may contact the shoulder belt, increasing the risk of death or serious injury. 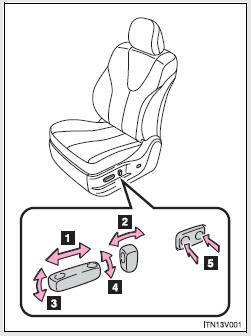 • Manual seat only: After adjusting the seat, make sure that the seat is locked in position.